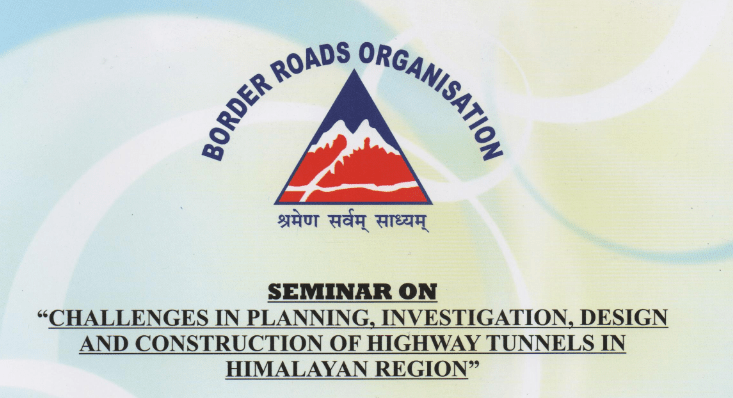 The Raksha Rajya Mantri, Dr. Subhash Bhamre inaugurated a two-day seminar on ‘Challenges in Planning, Investigation, Design and Construction of Highway Tunnels in Himalayan Region’ organized by the Border Roads Organisation (BRO). Engineer-in-Chief Lt Gen Suresh Sharma, Director General Military Operations Lt Gen Anil Kumar Bhatt, Managing Director, Delhi Metro Rail Corporation (DMRC) Dr. Mangu Singh, Director, Indian Institute of Technology Delhi, Professor V Ramgopal Rao and Director General Border Roads Organisation Lt Gen SK Shrivastava also highlighted the importance of this specialized subject. Infrastructure development in remote border areas of the country has always been a challenging task. Difficult terrain and adverse weather conditions, remoteness of the area, young and fragile geology have been posing serious challenges in progressing infrastructure works in these areas. Border Roads Organization which playing a vital role in the development of road network in border area of the country faces major challenges like Snowfalls and Avalanches in ensuring all weather connectivity to many such sensitive parts of border. To analyse the various challenges involved in each stage of planning and construction, it is therefore planned to have a two days deliberations on the subject. Geo Spar as a Golden Sponsor participated in the event and put up a stall showcasing and focusing on providing wide range of innovative engineering technologies and solutions based on Slope Stabilization and Ground Improvement. The function was attended by several senior officials from BRO, Ministry of Defense and representatives from various companies. They visited our stall and had fruitful interactions with the Geo Spar Team.